Working as a barista in a local bagel shop has thrust me into the hub of Jackson’s townspeople, who run on coffee alone, I’ve come to learn. We have our regulars, who get a nod of understanding that they will get their “usual” without needing say a word. Some come in the same time every day, some multiple times a day. It has been the best experience ever for me to meet people. When I first began working, I had my head down to really focus on learning how to do the job and to do it well. I honed in so hard that I barely noticed the people. However, as I have gotten more comfortable, I have watched my coworkers interact with our patrons, who they genuinely have a relationship with. I asked one how they know literally every local that comes through the door, and she smiled and told me to just ask them their name. It is the simplest act, and it is almost laughable that it’s just not first nature to us anymore. 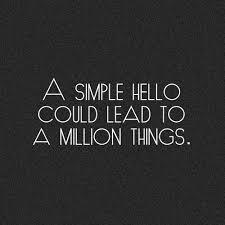 We are so wrapped up in our daily lives and the technology in our pocket that we may smile at passing strangers, but how often do we get to know them? I don’t just stop at work either. If I frequent a restaurant and end up with the same server (or bartender), I get to know them. Same goes to the cashier at the grocery store, or the clerk at the thrift store. Just having a familiar face to chit chat with while you run errands is so rewarding. Another reason I love this is because it shows you care. You make friends, and then you find you have common threads with them, through good old-fashioned conversations, rather than creeping on their timeline. Just the other day I was wearing an old high school volleyball shirt and one of the customers mentioned he had gone to the same high school, over 1,400 miles away, yet we both live in this tiny little town! It’s like a precious, gentle reminder that we aren’t alone in the world when we find someone and can say, “oh my gosh, me too!!!”. I can’t tell you the amount of times that I run into people just out and about that I’ve met through their work or mine. Just today, I went on a hike with a coworker and we ran into a new regular of ours. We sat and talked for a few minutes and it was so much fun getting to know someone that we would have just passed on the trail, had we not introduced ourselves over a simple transaction. So I encourage you, just ask someone their name that you don’t know. I can promise you their face will light up with a smile, and it will make a big impact if you keep it up.